Our Christmas Crochet course is a full one day course whereby you will work on Christmas Crochet projects throughout the day. 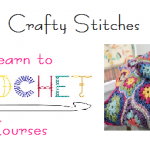 This course is aimed at those who have either attended our Learn to Crochet course or have the basic skills of crochet and wish to progress further. The cost is £50 per attendee and is run on a Saturday 10.00 am to 4.00 pm at the Memorial Court in Northwich. Included in the cost is a free Christmas Crochet pattern book, materials to use, lunch and refreshments throughout the day. To know the basic stitches – foundation chain, slip stitches, double crochet and treble crochet. A range of crochet hooks – ideally 2mm, 3.25 mm, 4mm, 5mm & 6mm. You will need the finer hook for fine crochet work. Please note that our courses need to be paid for in full prior to the course date. Refunds can only be given if we can re-sell your place and no refunds will be given within 48 hours of the course date.